Coinsurance, a term found in every health insurance policy, is your out of pocket expense for a covered medical or health care cost after the deductible, which generally renews annually, has been paid on your health care plan. Generally expressed as a percentage amount and outlined in the coinsurance clause of the policy, coinsurance allows the policyholder to share the cost of the insured service with the insurance company—your insurance company pays the portion of the cost of the service that is insured and you pay the remainder. 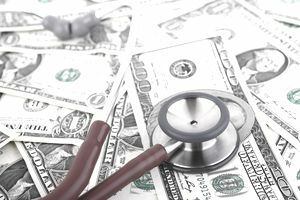 The insurance company generally bears the higher burden, paying the majority of the cost (the greater percentage) of any medically necessary health care service. Common divisions are 70/30 or 80/20, wherein your insurance company would pay either 70 percent or 80 percent, and you would pay the remaining 20 percent or 30 percent, respectively, out of pocket, after the deductible is met. The sum total, $700, is known as your out-of-pocket expense. The insurance company, paying the majority of the cost at the higher percentage, would pay the remaining $800. If you are fortunate enough to have coverage under two health insurance plans (for example, under a spouse or domestic partner plan) and one of them has a different coinsurance clause, more of your medical bill may be covered by strategically using coordinating of benefits when filing your health insurance claim. Note that if both benefit plans have the same coinsurance clause, then you will not be able to take advantage of this strategy. Policy deductibles renew and are paid annually. In other words, once your required annual deductible is paid each year, you will only be responsible for the coinsurance amount ("co-pay") listed in your policy for the remainder of that year. Understanding how coinsurance, coordination of benefits and deductibles work on your health plan can save money each year. It's important to fully read all conditions of a policy before you make your choice or sign a waiver of health insurance, for any policy. If you have questions, speak to your representative to fully understand your options.